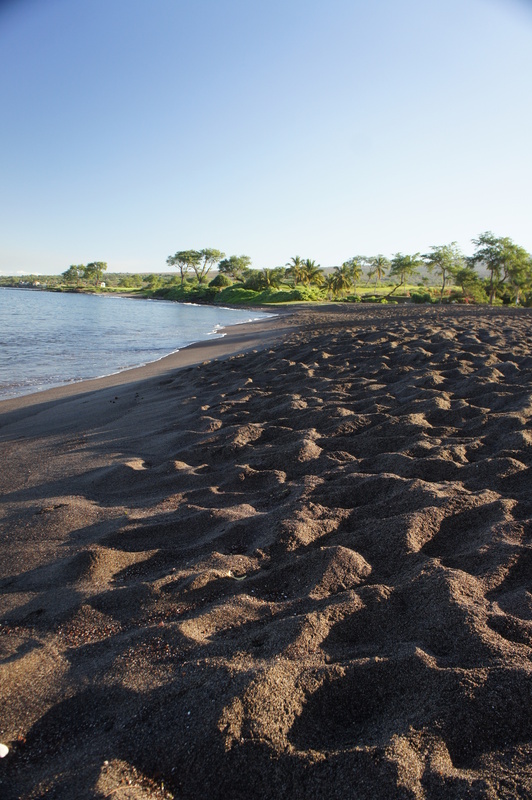 Oneuli Black Sand Beach in South Maui…no, you don’t have to drive all the way to Hana for black sand! Oneuli is located just north of the Pu’u Ola’i cinder cone (which can be seen from just about anywhere on the South Maui coast). Go south on Wailea Alanui Dr. from Wailea, which turns into Makena Rd. Turn right at an easy to miss dirt road 3.8 miles south of the Grand Wailea Resort. If you get to Big Beach, you’ve gone too far! So are you ready to hit the beach? You don your bathing suit, grab a drink (or two), a towel, your sunglasses, jump in the car, and bam! You are ready to get bronzed and beautiful……If you have a family, especially with little ones, you know that going to the beach isn’t quite so easy! Just packing the car and getting everybody ready is a major accomplishment. So what makes a beach on Maui as “family friendly” as possible? Easy access: you don’t want to park 1/2 a mile away and drag all your gear and clan along a busy highway just to get to the beach. Shade: you want trees around so you can set up your keikis where they won’t get burned. Rocks and other interesting things: kids love to explore when at the beach (not sit on their duffs like us). A playground is an added bonus. Amenities near by: no matter how carefully you plan, you will forget something. It is nice to be able to jump back in your car, go to the store, and be back in less than 10 minutes. Does such a place exist on Maui? Glad you asked. My recommendation, based on the above criteria, for the best beach on Maui for families and kids is Kamaole III in Kihei. In addition to the above, you’ll find actual bathrooms (important at times! ), picnic tables to make eating easier, and a large grassy area if you have had enough of the sand. Enjoy this awesome beach on Maui with your family! For more ideas on how to enjoy time on Maui with kids, see Maui Jon’s “Maui Kids & Family Fun” Page. What do you think? Any other Maui beaches you’d recommend to families with kids? If you are new to Stand Up Paddleboarding (SUP), Maui is the perfect place to try it out. If you’ve been envious of the guys and gals surfing the big waves, but are chicken (like me) or just don’t want to work that hard, you have to try SUP. I’ve seen locals doing awesome waves and moves on them, but also plenty of people just enjoying the water from an SUP. Beginners will need protected waters with just a little bit of wave action. I think the best beach on Maui to learn SUP is Kalama Beach Park in Kihei. No, you won’t find lots of sand like on other Maui beaches, and maybe it isn’t as picturesque as the postcard beaches that are strewn throughout Maui, but this is the place to go for SUP beginners. There are several places to rent SUPs right across the road, and a 2 minute walk later you are in the water ready to try your SUP. The wave action seems to be just right for beginning SUP, and you will be sure to see many other folks there trying their hand at this great sport. Like many activities on Maui, mornings are the best for SUP because you are more likely to get calm waters and minimal wind. Good luck, and hang loose! 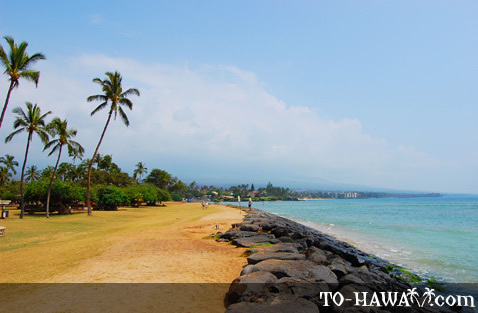 What is the best beach on Maui that is also a great snorkeling location? This is different than asking what is the best place on Maui to snorkel, since most of the best spots don’t really have any beach to speak of. Having a beach at your snorkel spot may appeal to you if you have family members who don’t snorkel but still want to accompany you and do more than sit on uncomfortable rocks waiting for you to come back. My first choice for best beach on Maui to snorkel is in West Maui at Black Rock, on the north side of famous Ka’anapali Beach. If you are staying in Ka’anapali, access is easy because you don’t have to contend with parking. There is a public parking garage at the north side of Ka’anapali Beach, but it does fill up frequently by mid-morning. The snorkeling around Black Rock is usually good, and fairly unique because of the sheer lava wall that you can swim along. This is one of the few snorkeling spots where early morning may not necessarily provide the best visibility because the lava wall will still be in shadows until the sun gets high enough in the sky. If you are staying in Kihei or another South Maui location, I recommend Ul’ua Beach as a great snorkeling location that also has a great beach. Ul’ua Beach is in the Wailea/Makena area of South Maui. See my post on Early Morning Snorkeling at Ul’ua Beach for more details. This is second in my series of posts on “Best Maui Beaches.” Check out my first “Best Maui Beaches” post: Best Maui Beaches: Boogie Boarding. As I mentioned in my previous post on Best Beaches, you really can’t answer the question “What is the best beach on Maui?” Each beach is unique, and depending on what you are looking for, the answer will be different. 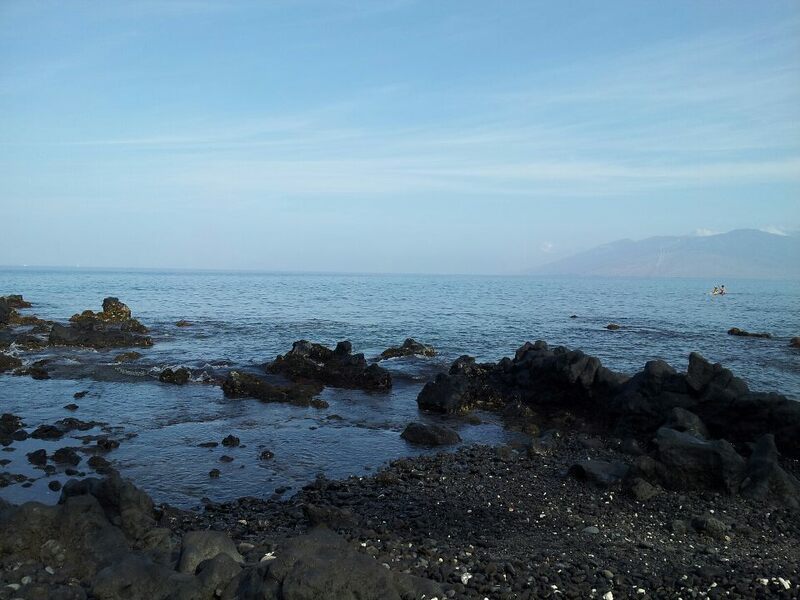 So here is the first of several posts to help you find the perfect beach on Maui…customized for what YOU are looking to do. Today’s Best Maui Beach post will focus on the insanely fun activity of Boogie Boarding. My nomination for the Best Boogie Boarding beach on Maui is….D.T. Fleming Park north of Kaanapali in West Maui. This beach always seems to have great wave action for boogie boards. I also like it because of the lifeguard tower (you never know…), outdoor showers, restrooms, and easy access. Beautiful D.T Fleming Beach in West Maui. Photo courtesy of HawaiiGaga.com. Honorable mention: if you really don’t want to drive up north, Big Beach (Makena Beach State Park) is another fun boogie boarding beach. But be careful, sometimes the waves at Big Beach are a little too aggressive in their shore break and it can get dangerous. No restrooms, but there are lifeguards. Enjoy that Boogie Boarding action! Dr. Beach has come out with his annual top 10 beaches in America list, and Maui’s very own Hamoa Beach is #5. Coronado Beach in San Diego received top honors this year, with Kahanamoku Beach (Oahu), Main Beach East Hampton (New York), and St. George Island State Park (Florida) rounding out the top 5. I don’t know how a beach in New York can even compare to a beach on Maui, but I will defer to the expert! I don’t think you can really do a comparison of beaches unless you identify what you are looking for in a beach. Seclusion? Big Waves? People watching? Boogie boarding? Picture taking? Kid friendly? Combining everything into one magical score, no matter how many factors you take into account, is like comparing all the different car models in the world on the same list. Watch this space for my own list of “Maui’s Best Beaches”!